Tomorrow more than 10,000 people a day will be visiting the PGA at Palm Harbor, Florida and, with fewer than 1,000 hotel rooms open, there is plenty of money to be made for accommodations. Rent My Vacation Home dot com Karen Langhill says “if you’re on the PGA tour this year, the time to start marketing your home is now." She estimated that the average home could get at least $2,000 for the week. There could be demand further away as well. Langhill said she has gotten hundreds of calls from people looking to rent a home. She said there will be more demand than people realize. “We are overwhelmed,” she said. “I think we’re going to be nicely surprised at the final numbers.” She says Rent My Vacation Home is the leader in vacation home rentals at the PGA tournaments because they offer a $1.00 trial 1st month then $16.00 per month after that and homeowners can cancel anytime they don’t need the rentals. miles watch for signs to Public Parking. 12:30pm Shotgun Start; FREE Admission. Gates open at 7am; GOLF Channel from 3pm – 6pm. Gates open at 7am; GOLF Channel from 1pm – 3pm, NBC from 3pm – 6pm. Gates open at 7am; GOLF Channel from 1pm – 3pm, NBC from 3pm – 6pm . Monday, March 19 Monday after Challenge (play the course the pros play). About Rent My Vacation Home dot com(THE leader IN PGA Rental Homes). 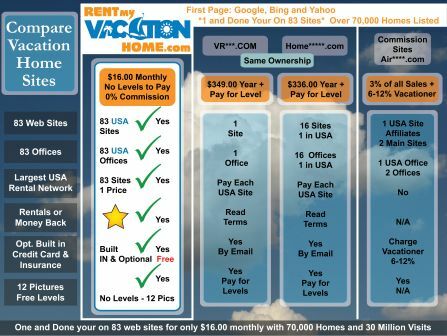 •Advertise Your Home to Millions!, Join 83 Sites of Vacation Rentals. •No levels to Pay and 0% Commission. •Inquiry form on 83 sites & 12 Extra Large Pictures Included. •Video tour on 83 sites with one form. •Traveler map on 83 sites with one form control.